The Olympian Peak I by Backyard Adventures is their best-selling play set for a reason; it offers the capability to attach taller swings and longer slides to an already tremendous structure! It’s a perfect choice if your little Olympians are getting a bit older and would like more of a challenge. 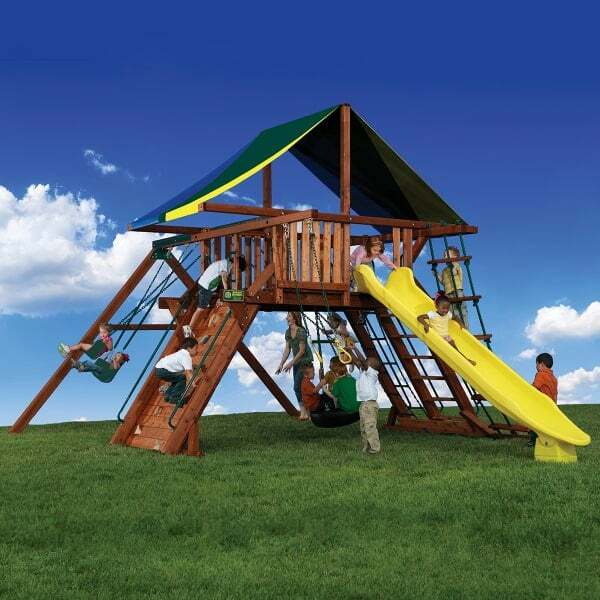 Like all the Backyard Adventures play sets, the Olympian Peak I is crafted from heavy-duty, weather-friendly cedar lumber, which will provide your kids with outdoor fun year after year. The Peak sets are all equipped with angled legs that create more play space under the set, while also helping the set to remain level, steady and safe, even atop un-level ground. The Olympian Peak set features three different versions, each with a 6’ high deck that is 6’ x 6’, plus 4’’ x 6’’ angled legs. Each set also includes a 6’ rock wall for climbing, a ladder that features both chain and flat steps for climbing, a rope ladder for climbing, a tire swivel swing for swinging in groups, a trapeze bar for swinging from the arms, two belt swings for single-seat traditional swinging, and a 12’ slide that delivers an exit with a rush. The Olympian Peak 1 is equipped with many accessories for exciting play, but the Olympian Peak 2 and Olympian Peak 3 feature even more accessories for jumping, climbing and playing. Review all of your options now!